2005 proved to be another successful year for the FEBT restoration work at Rockhill Furnace. Numerous projects were begun and completed and volunteer hours were the highest yet. 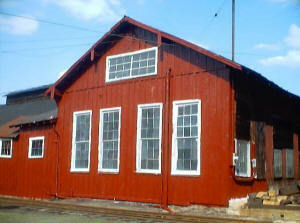 The Friends of the East Broad Top, Inc. is a 501(c)(3) nonprofit dedicated to the preservation and restoration of the East Broad Top Railroad National Historic Landmark. FEBT's efforts take on many facets, only one of which being the direct restoration work. For more information stop by at our website. In Rockhill Furnace, the FEBT crew has been working since 2002 to restore the facilities there. Work is performed on structures, rolling stock, track, and other facilities. Below is a summary of our projects we have pursued in 2005 in Rockhill Furnace. The Boiler House coal bin in March 2005 (above top) and November 2005 (above). All photos by Christopher D. Coleman. With work on the east wall of this building mostly completed, attention turned to the north wall. It was found to be necessary to completely rebuild the coal bin attached to the north wall before beginning work on the Boiler House north wall itself. The bin is a smaller post and beam structure where a conveyor took coal from a track pit and piled it for use in the shops boilers. Years of water leakage onto coal dust created sulfuric acid that ate away the bottom of all the posts and siding of the building. 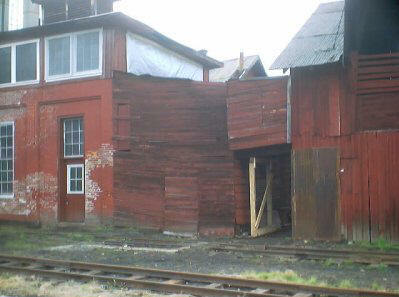 The siding was in poor condition as well. Posts were installed to bolster the west wall of the Boiler House while work proceeded on the Coal Bin. The second story gangway between the Foundry and Coal bin was also supported by cribbing. Demolition began with the removal of the badly deteriorated roof, which literally disintegrated when disassembled. After the roof was safely removed, the west wall was brought down as one piece and disassembled on the ground. The north wall was then dismantled. The old concrete foundation for the structure was cleaned and a new perimeter foundation poured on top of it. A new pressure treated sill plate was laid down and replicas of the hybrid post and Beam/stick walls were constructed, joining with the Boiler House wall and preserved west wall. Exact replica siding milled by Amish craftsmen was purchased and installed on the two walls. Main roof beams were hoisted into position atop the wall beams to match the position of the originals. Roof joists and roof boards were installed atop the beams. A metal roof was then installed. Although the two previous roofs were not metal, this roof should last much longer in this shallow pitch application. At the end of the year, trim was installed and all the new siding and trim was primed for the winter. In the Spring of 2006, work on the coal bin will be completed with siding repair to the west wall, addition of trim and door on the east wall and final painting of the structure. Work can then begin on the boiler house wall itself. The new restoration space in the EBT Paint Shop. As was announced in 2004, FEBT negotiated a lease on this building for use as a restoration shop. Basic cleanup of the building was started in November 2004, but work in earnest started in 2005. All the window sashes on the west side of the building were removed and temporary coverings applied while the sashes were repaired or rebuilt. A great deal of scrap and trash that had accumulated in the building was disposed of and extra lumber and historic items were moved to other shop buildings. Several non-original power tools were repaired and reconfigured for use by the FEBT crews. New electrical service was installed in the building to provide year round power (the EBT shops power is disconnected during the winter and spring.) New electrical lines were installed throughout the building to provide reliable and robust power to whatever tools are needed. As the year has progressed window sashes have been repaired and installed in the primed and painted window openings. This process will continue in 2006. The biggest improvement in the building was the pouring of a new concrete slab floor. The old floor was broken and disintegrating and the track was not level. A dedicated crew spent a week in the shop installing the new floor. Everything in the shop including flatcar 119, several workbenches and a dozen pieces of equipment was moved out and the old broken floor removed with aid of the Rockhill Trolley Museum's bobcat. An unstable and unneeded pit was filled in and two good pits were repaired. 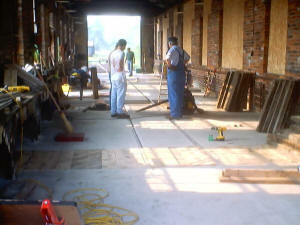 Gravel was used to fill in low areas and level rail laid in the building with steel ties and rebar. Air and power lines were laid to provide services in the pits and in floor outlets. Two truckloads of concrete were poured in the building to bring the new floor up to the level of the railhead. Once concrete work was done, new heavy wood decking was cut to cover the work pits. The result is a first class surface on which to restore any of the railroad's rolling stock. 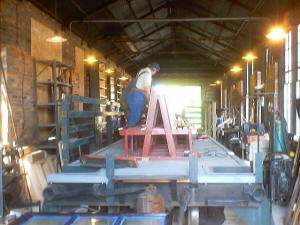 The shop was immediately put to use completing the rehabilitation of passenger flat car 119. In late 2005, the 1880s combination car #14 was rolled into the shop for a multi-year restoration project. Improvements in shop facilities are ongoing and include a compressed air system, power for welders and forced air heat. In 2006 a restoration pad will be poured around the track south of the building as an outdoor workspace on additional rolling stock. 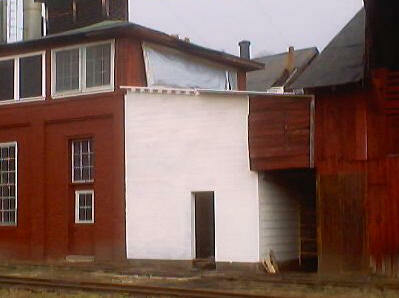 The west end of the Machine Shop as it appeared before work (above top) and in November 2005 (above). Work on the Machine Shop picked up from work done there in 2004. A new area of the shop was addressed in 2005 when work began on the west end. The five windows on that wall were repaired, reglazed, puttied and primed. The entire outside wall, as well as the adjoining Tool Room walls were power washed, primed and painted. During the summer work continued around the corner on the western gable of the north wall. Seven windows were repaired, reglazed, puttied and painted. The entire wall was power washed, primed and painted. The small tool room addition to the Machine Shop received the same treatment. Late in the year the area around the main shops entrance received further attention. All of the lower part of the wall and the upper part by the Boiler House were primed and painted. Partial repairs were made to the roof eaves in this section. Work on the Machine Shop north and west walls should wrap up in 2006. New on the project list, work began on the west end of this building. Lower sections of the wall were power washed, primed and painted. As the Machine Shop wraps up, this building will be the focus of window and wall repairs. 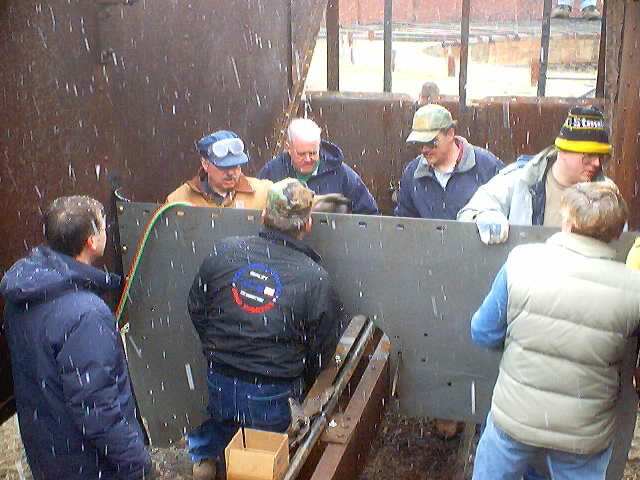 In a March snow squall, the FEBT crew forges ahead in hopper #802. This project started in November of 2004. This unusual side dump car was reconfigured for fill work from one of the EBT's original order of steel cars in 1913. Used into the 1970's, 802 has set for over two decades in the south end of the yard, its steel too corroded to be used any longer. 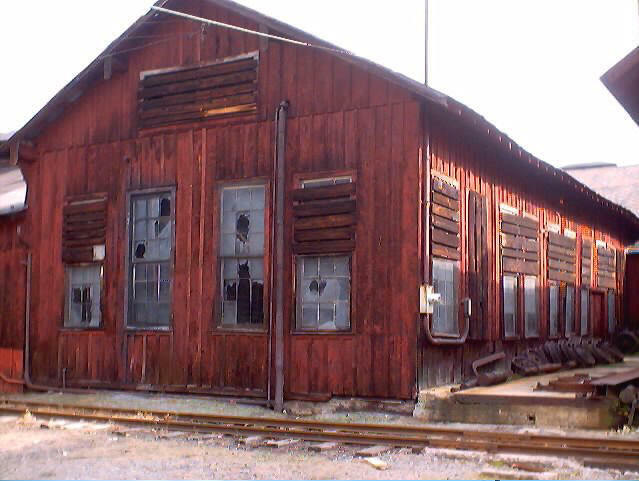 Damage to the railroad incurred by hurricane Ivan and the inefficiency of using bottom dump hoppers for fill repair led to the decision to rehabilitate this car. The side sheets were the only ones deemed repairable on the car, and work started with the documentation and removal of all the interior hopper and slope sheets and doors. The interior was stripped down to the frame, which was examined, rust abated and painted. All the air lines were removed and replaced and the triple valve and cylinder were rebuilt as needed. Additional fittings were added for the operation of air tampers on MOW trains. Small sections of the side sheets were removed and patches welded in and parts of the ribs were repaired or reinforced. The steel plate on the end of the draft gear replaced the original corroded sheets. New sheets were ordered to match the original, but were thicker for additional longevity. This car is much more complex in its construction than the standard three bay EBT car and required more than fifteen separate sheets to be made. Some of the sheets weigh several hundred pounds and were lifted into position by hand. Spare EBT door latches were rebuilt from EBT inventory and installed on the car. Most sheets were primed and painted prior to installation. All the repaired metal components on the car were rust abated and painted. Although not completed in 2005, the last sheet of steel went into the car in early 2006. Installation of the doors, additional hardware and swapping the car to its original trucks will occur in 2006. The control of mother nature has been of secondary priority for some time. The FEBT Brush Crew has reversed that trend by removing brush that has encroached on the EBT for some time. They have worked along the main line, trimming back trees that were brushing against the cars, potentially damaging them or injuring passengers. Another area addressed was along Jordan Creek on the western edge of the yard. Brush here was encroaching on the Paint Shop track and was actually growing into the Paint Shop windows. Brush was removed from Meadow Street to the Carpentry Shop, where the track peels away from the creek. Work along the south leg of the Rockhill wye was continued from last year. The brush was obscuring the train crew's view of the train while backing around the wye. Also, the brush had enveloped the EBT hoppers stored on the old Coach House track. Crew members near finishing the work on flatcar #119. As a follow up project to Caboose 28 (completed in August of 2004), the FEBT crews rehabilitated flatcar 119. 119 was built in the EBT shops in 1925 and has been used in excursion service since the 1960 reopening. 45 years of service had taken their toll on the wood portions of the car and they had deteriorated to the point that they had to be replaced. 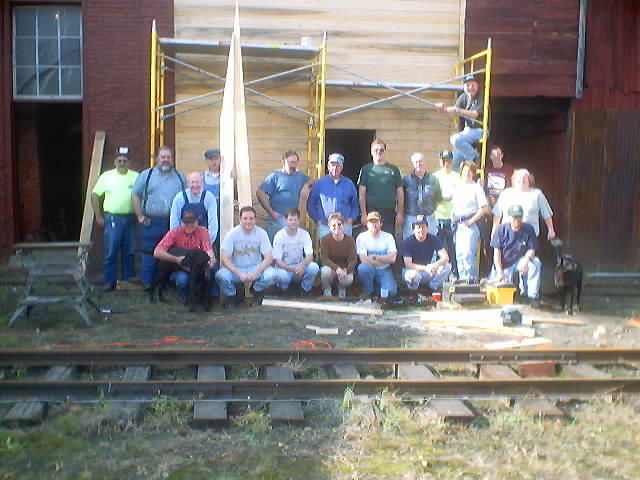 During 2005 the entire structure of the car from the wood deck up was rebuilt or replaced. An entirely new deck was laid on the car including supporting timbers. All the benches and railings were rebuilt. The crew of the November work session. During 2005 over 100 ties were installed in the south leg of the Rockhill Wye greatly improving the condition of this track. This work was performed by a volunteer crew from the Bucksgahuda and Western RR. As in past years a dedicated group of volunteers has worked to clean and cut donated glass in preparation for installation in the shops. This often thankless work has saved a great deal of funds that can instead used on other supplies and equipment for the crew. FEBT volunteers assisted with the return of #15 by cutting and installing all the sheet metal over the boiler lagging. We have a full schedule for 2006 and lots of projects to tackle. Won't you consider joining us in our efforts to save old Eastie?